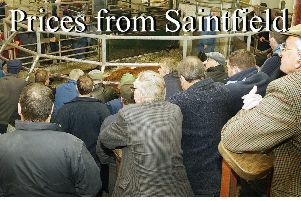 A super entry of 230 calves on Thursday, January 10th met a flying trade for all types on offer. R Boyd, Garvagh, Hereford £445, Shorthorn beef £330; D McKinney, Maghera, Aberdeen Angus £357, £347; P and R McMaster, Ballyronan, Aberdeen Angus £350, £315; W Campbell, Magherafelt, Lim £335; M Kelso, Portglenone, Simmental £332, Hereford £332, Aberdeen Angus £295; J McCrea, Donemana, Aberdeen Angus £330, Limousin £325, Aberdeen Angus £315, £265, Simmental £260, Aberdeen Angus £205; Lakeview Farms, Ballyronan, Belgian Blue £325, Aberdeen Angus £310, Belgian Blue £308, £270, £240; E Tosh, Coleraine, Fleckvieh £290, £255, £240; J Rainey, Ahoghill, Simmental £350, £262; D and S Sloan, Upperlands, Belgian Blue £312; S Dobbin, Bushmills, Hereford £295, Friesian £232; E and S Bloomfield, Portglenone, Aberdeen Angus £290, Simmental £235; G Kerr, Ahoghill, Aberdeen Angus £287; J Lyons,Coleraine, Belgian Blue £275; W and I Whiteside, Limavady, Belgian Blue £275, £210; Magherafelt farmer, Belgian Blue £268; H and J Campbell, Ballymoney, Aberdeen Angus £250; J Boreland, Bushmills, MB £238; R Gillespie, Ahoghill, Limousin £222; G Bates, Moneymore, Hereford £220, £208; J Hayes, Ballymena, Hereford £215 and J Oliver, Limavady, Aberdeen Angus £215. Heifer calves: Ballymena farmer, Aberdeen Angus £395, Belgian Blue £278; N G and C Smyth, Glenwherry, Simmental £360, £330; D McKinney, Maghera, Aberdeen Angus £350, £310; J Devlin, Moneymore, Aberdeen Angus £342; R Boyd, Garvagh, Charolais £340, Aberdeen Angus £340, Hereford £335, Shorthorn beef £330, £245; Lakeview Farms, Ballyronan, Belgian Blue £340, £320, £295, £225, Aberdeen Angus £215; J McCrea, Donemana, Aberdeen Angus £340, £310, Simmental £235, Aberdeen Angus £215; P and R McMaster, Ballyronan, Belgian Blue £335; S Dobbin, Bushmills, Hereford £290, £230; J Boyd, Swatragh, Hereford £265, Aberdeen Angus £250; I Steele, Antrim, Belgian Blue £250; M Black, Aghadowey, Belgian Blue £227; G Kerr, Ahoghill, Belgian Blue £240, Aberdeen Angus £200; E and S Bloomfield, Aberdeen Angus £230; J Oliver, Limavady, Aberdeen Angus £220; M Kelso, Portglenone, Simmental £215; G Kerr, Ahoghill, Aberdeen Angus £200 and J Lyons, Coleraine, Aberdeen Angus £200. Good young calves to £238. 55 on offer with more required to satisfy demand. A good entry of 500 on Monday, January 14th met a sharper trade. Lambs sold to £101.00 to 433 per kg. H McErlean, Portglenone, 20k, £86.50 (433); I McAleese, Aghadowey, 22k, £94.80 (431), 20.5k, £87 (424); T Wright, Ballymoney, 23k, £97.50 (424); A Black, Garvagh, 23k, £96.20 (418); M Millar, Rasharkin, 23.5k, £98.20 (418); N McClure, Ballymoney, 23k, £96 (417); J Moody, Articlave, 23k, £95.70 (416); J Patterson, Kilrea, 21.5k, £89.40 (416); H Wylie, Rasharkin, 23.5k, £97.80 (416); R and S McCahon, Aghadowey, 22k, £91.20 (415), 21.5k, £87 (405); Ballymena farmer, 21.5k, £89.20 (415); O McIlvar, Aghadowey, 16k, £66 (413); P McCracken, Cookstown, 21k, £86 (410); J Kerr, Macosquin, 22.5k, £92 (409); J Thompson, Killaloo, 24k, £96.20 (401); D McAllister, Portglenone, 23k, £92 (400), 24k, £95 (396); D Torrens, Garvagh, 24k, £95.50 (398); R and J Watson, Rasharkin, 23.5k, £93.60 (398); J Sloan, Rasharkin, 25k, £98.80 (395); D Starrett, Kilrea, 23k, £90.80 (395); J Currie, Ballymoney, 25k, £98.40 (394), 23.5k, £92 (392) and R C Reid, Glarryford, 25k, £96.60 (386). Ewes and rams selling to £100. A good entry of dairy stock on Tuesday, January 15th met a super trade to a top of £2,220 for a calved heifer. T McCracken, Limavady, calved heifers to £2,220, £2,190, £2,010, £1,960, £1,800; W L and D Campbell, Coleraine, second calvers to £1,800, £1,600; W and A Houston, Glarryford, second calver £1,780, third calver £1,710 and fourth calver £1,580. A good entry of 180 stock on Wednesday, January 16th at Kilrea continued to meet with a good steady trade. Steers sold to £1,325, heifers sold to £1,285 and fat cows £1,200. E McSorley, Draperstown, 560k Limousin £1,000 (179), 660k Belgian Blue £820 (124); C O’Kane, Maghera, 680k Belgian Blue £1,135 (167), 860k Limousin £1,200 (140); A Andrews, Castlerock, 660k Limousin £950 (144); N Campbell, Kilrea, 580k Friesian £830 (143); J Morrison, Kilrea, 680k Limousin £960 (141); A Pinkerton, Ballymoney, 630k Friesian £890 (141); W Chesney, Ahoghill, 620k Limousin £870 (140); Draperstown farmer, 590k Shorthorn beef £780 (132), 490k Belted Galloway £600 (122); I Tanner, 770k Simmental £1,000 (130); B McAfee, Aghadowey, 590k Friesian £740 (125); P McCord, Randalstown, 580k Belgian Blue £720 (124), 690k Simmental £780 (113); M Kelly, Ballycastle, 520k Limousin £640 (123), 640k Aberdeen Angus £770 (120), 630k Simmental £700 (111); R Scullion, Knockloughrim, 630k Simmental £760 (121), 480k Limousin £560 (117); M Glass, Maghera, 570k Simmental £665 (117); L Bradley, Knockloughrim, 640k Aberdeen Angus £740 (116); R and R Cousley, Moneymore, 590k Fleckvieh £680 (115), 720k £825 (115); I Wright, Garvagh, 570k Limousin £645 (113); H McPherson, Macosquin, 730k Simmental £800 (110). Ballymoney farmer, Simmental heifer with Limousin heifer calf at foot £1,550. Heifers: S and B Jamieson, Ballycastle, 290k Limousin £805 (278), 330k, £590 (268), 250k Charolais £615 (246), 380k, £805 (212), 360k, £750 (208); R McGinley, Ballymoney, 330k Limousin £725 (220), 470k Belgian Blue £925 (197), 330k Simmental £635 (192); P McCord, Randalstown, 310k Limousin £660 (213), 330k, £665 (202); G Hayes, Ballymena, 580k Limousin £1,200 (207), 560k Aberdeen Angus £1,140 (204); J Lennox, Castledawson, 620k Limousin £1,250 (202), 630k Charolais £1,215 (193), 690k, £1,285 (186), 630k Limousin £1,165 (185); H Savage, Magherafelt, 320k Belgian Blue £645 (202), 370k Simmental £745 (201), 410k Charolais £800 (195); T and A Campbell, Rasharkin, 440k Limousin £865 (197), 460k, £885 (192); J McKeague, Dunloy, 600k Charolais £1,180 (197), 560k, £1,080 (193), 600k £1,130 (188), 620k, £1,150 (186); T Scott, Swatragh, 380k Limousin £745 (196), 520k, £1,000 (192), 510k, £975 (191); J McGarry, Dunloy, 480k Charolais £930 (194), 460k Limousin £885 (192); Kilrea farmer, 430k Charolais £835 (194), 440k Limousin £830 (189); R W Kane, Ballintoy, 400k Limousin £765 (191) and C Mooney, Rasharkin, 510k Limousin £970 (190). Steers: P McCord, Randalstown, 290k Limousin £675 (233); H McPherson, Macosquin, 320k Belgian Blue £695 (217), 350k Simmental £730 (209), 410k Limousin £800 (195); G Boyce, Garvagh, 420k Limousin £885 (211), 430k, £900 (209), 510k, £1,050 (206); A McDonald, Portglenone, 560k Belgian Blue £1,170 (209), 560k, £1,145 (205), 590k Charolais £1,180 (200); W Bradley, Knockloughrim, 420k Hereford £865 (206), 430k, £840 (195); J Lennox, Castledawson, 660k Charolais £1,325 (201); R Barclay, Dunloy, 400k Simmental £800 (200); T Fulton, Castledawson, 530k Hereford £1,010 (191), 600k, £1,135 (189); C Mooney, Rasharkin, 540k Limousin £1,020 (189), 520k, £975 (188) and S Richmond, Macosquin, 540k Limousin £1,005 (186).